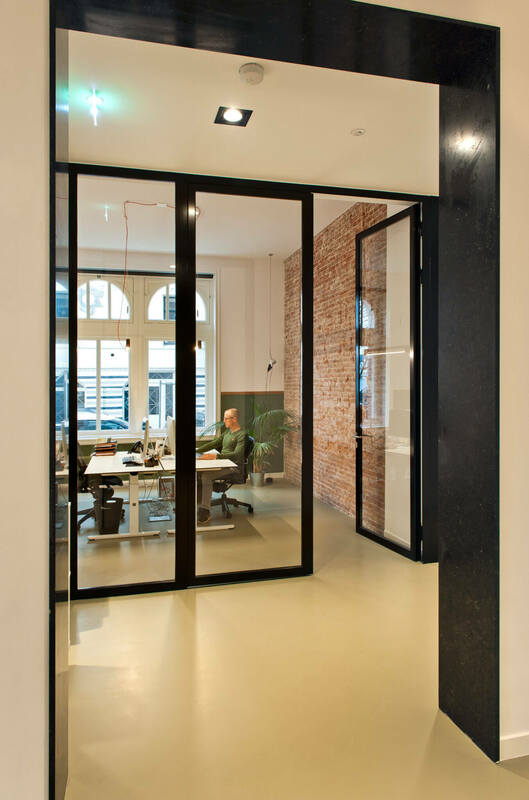 In 2015 Standard Studio was asked to design an attorney office in an old building that used to be the head-office of the firefighters in Amsterdam. The once monumental office builbing is transformed to accommodate apartments on the upper floors and offices on the ground floor. The floor plan is designed to be very open but still can be private at the same time. With big steel doors that can be completely opened the height of the space is emphasised. In every space a part of old brick walls is exposed to remind the user of the history and add warmth to the workspaces. Along the outer walls a soft green coloured part connects the spaces throughout the whole plan. The openings in the walls are marked with a Belgian hard-stone frame that acts as a porch to the space behind.